Trevor Siemian will assume duties as full-time quarterback in 2014. The senior spent last season splitting time at the position with now-departed Kain Colter. After two years spelling Kain Colter under center, senior Trevor Siemian enters 2014 as the only show in town. Siemian showed flashes of star potential last season, including a 414-yard, four-touchdown performance at Illinois to end the season, but struggled at times, particularly during Northwestern’s midseason slump, when Colter’s injuries forced him into full-time duty. Even though he will no longer have the stalwart Colter playing slot receiver, a healthy stable of running backs, headlined by senior Venric Mark, and a deep group of wide receivers will surround Siemian. 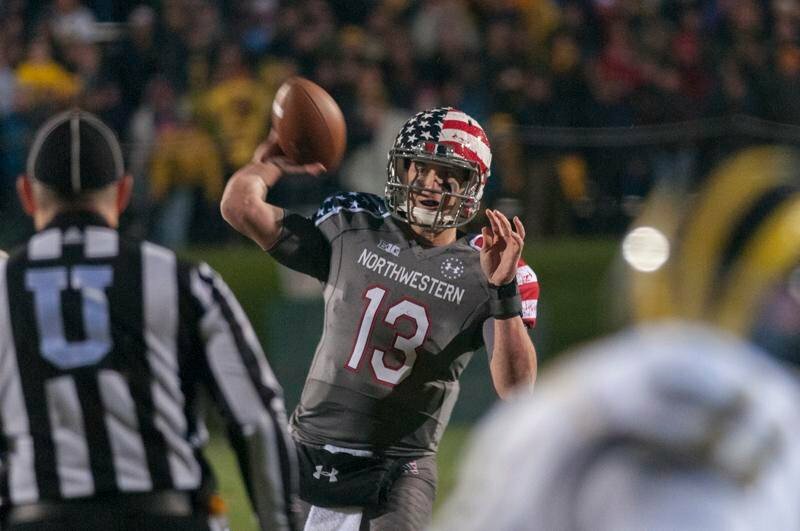 Despite all the question marks surrounding Northwestern this season, it is hardly an overstatement to say Siemian’s performance will be the biggest factor in the Wildcats’ success. The Big Ten is hardly the high-flying Big 12 or Pac-12, but it is nearly impossible to win with subpar quarterback play, particularly given NU’s lack of a shutdown defense. Siemian’s 13-for-34 performance in NU’s 35-6 loss to Wisconsin (a game in which Colter suffered an injury and threw just five passes) is a glaring example of how the Cats’ offense can get stuck in neutral when things go wrong. Siemian was generally at his best playing Robin to Colter’s Batman. How he responds to being the big man on campus will go a long way toward determining whether NU can bounce back from the bitter end to last year. Most have assumed that with Colter gone, the read-option will leave NU’s rushing attack. Siemian’s speed won’t have anyone mistaking him for Colter, but he has made key plays with his feet at times when called upon, including a rushing touchdown in the 2013 Gator Bowl. If he can keep defenses honest with his legs, it will create gaps in other areas, opening up room for his receivers and Mark, who has struggled running the ball without the threat of Colter to open up holes. Due to seniority and familiarity with the offense, junior Zack Oliver will likely enter the year as the backup to Siemian. Oliver is unlikely to step into a similar “1b” role as Siemian has played: He has thrown just four passes over the last two seasons and doesn’t offer the same complementary talent. Matt Alviti, a redshirt freshman, was a highly touted recruit coming out of Maine South High School and will likely be in competition to start next season but may need another year of preparation. If the season goes south, look for coach Pat Fitzgerald to give Alviti a chance to prove himself heading into 2015.